It’s the beginning of May, time to clear away my mess and open the kitchen door to show you what’s been happening here recently. As always thanks to the lovely Celia at Fig Jam and Lime Cordial for hosting this inspirational forum. Click on the link to see what’s happening in Food Blogger’s kitchens all around the world. My regular readers will be aware of our apple tasting adventures in an effort to find the perfect apple for making apple pie. All up 15 varieties were tasted with surprising results. Here’s the taste tester at hard at work, and leftovers of the miraculous crumble made with the apples that were liked least. Read more about our apple tasting here and here. I’ve been experimenting with roasting rhubarb too. This batch was with orange and cardamom. I love the deep crimson hue of this roasted rhubarb, but roasting accentuates the oxalic acid to the point that it almost unpalatable. It needs something sweet and creamy to balance it out! I’m having a love affair with kohlrabi. I had never tasted this curious vegetable until earlier this year when Sally from My Custard Pie encouraged me to give it a try. The flavour is quite mild, faintly reminiscent of raw cabbage. It has a fabulous fresh crunchy texture. I like it best eaten raw, finely julienned and dressed with a lemony vinaigrette. 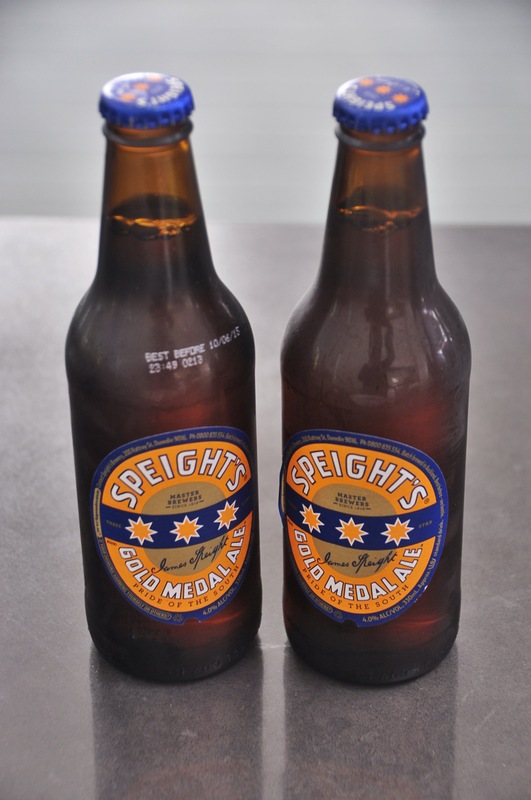 While travelling in New Zealand during March I discovered Speights GMA beer. It has become my new favourite. It’s a full flavoured ale with a clean fresh taste. Luckily Speights is readily available from my local bottle shop. The Domaine Chante Cigale Chateauneuf du Pape on the other hand was not so easy to come by. After reading a post by Stefano at Clicks and Corks about this French wine style I decided I’d like to taste it beside Nine Popes made by Charles Melton in the Barossa Valley. I’m a big fan (and consumer) of Charlie’s wines. Nine Popes is a blend of grenache, shiraz and mouvedre, a copycat of Chateauneuf du Pape. 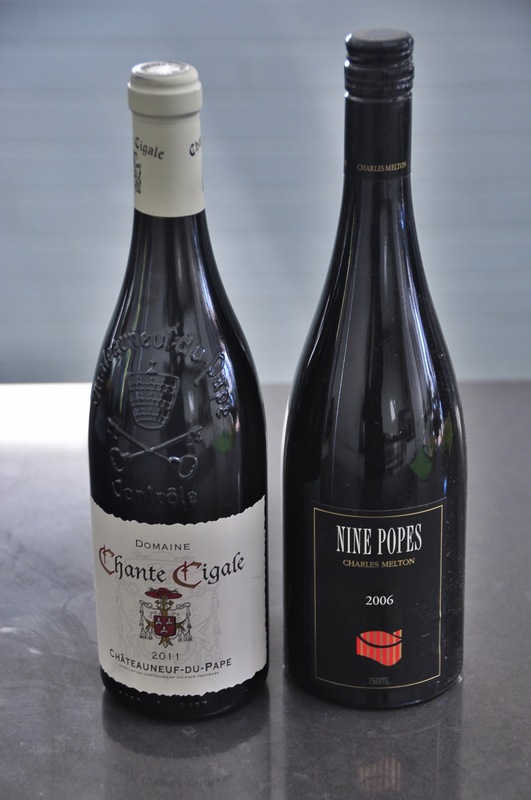 Stefano recommended Domaine Chante Cigale to use as a comparison. Fortunately I easily sourced a single bottle online. The first bottle went astray(?) with the courier, the next bottle despatched then took 2 weeks to arrive. I’m curious to see how they compare and plan to taste them side by side using Stefano’s tasting and assessment guidelines. Sichuan peppercorns are indispensable In My Kitchen. I dry roast them on a pan and then grind them to a powder with sea salt, black peppercorns and a few Tasmanian pepper berries for extra bite. This salt and peppery blend is delicious on stir fried pork belly, deep fried calamari, grilled chicken and fish. I like the mouth numbing sensation of Sichuan Peppercorns but especially like their spicy perfumed flavour. Last but by no means least we have two bars of delicious coffee nougat sitting in our fridge until we can no longer resist. 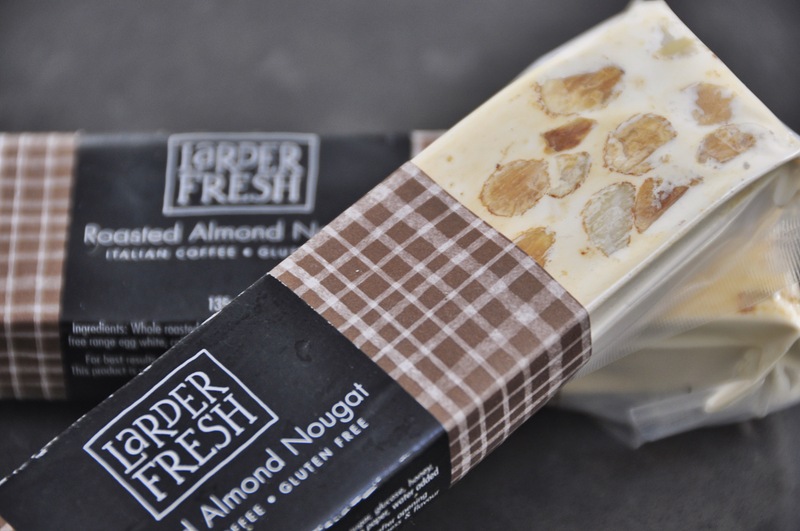 Made with toasted almonds, the body of this nougat is rich with the flavour of espresso. This wonderful treat is made locally by Larder Fresh, and is available from our favourite Farmer’s Market at the Abbotsford Convent. So, what’s been happening in your kitchen? i have never had kohlrabi – i had better try it:) The nougat sounds so yum. and i love tassie mountain pepperberries. so delightfully crunchy and give such warmth to a dish. Apple and rhubarb are delicious MFF, but rhubarb with banana is better! Thanks for dropping by! Ooh I love the idea of the apple comparison, just the kind of thing I love to do, must go and read those posts right now! Hi Kim, just deciding what to cook to accompany the wine taste testing. I expect to love Chateauneuf du Pape too, I love the Aussie version! We’ve had some amazing times at the winery with CM Fiona, he’s an incredibly generous host and a lot of fun! An amazing thing happened with the least likes apples, when all mixed together they tasted fantastic! My goodness, you are organised with that apple testing! I love roasted rhubarb and agree with you that it needs a sweetener to balance it out. Interesting that you paired it with orange & cardamom (note to self: must try this). 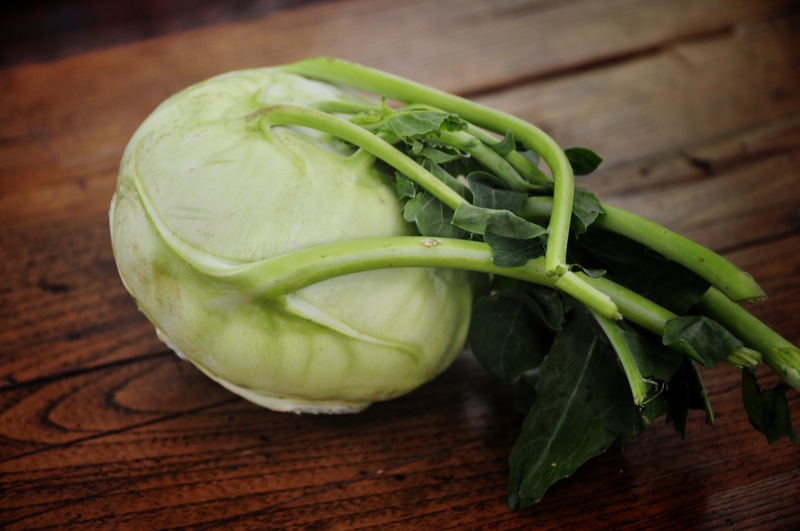 I’ve always avoided kohlrabi in the supermarket, but you’ve now made me curious. Your kitchen is an inspiration as always, Sandra! I’m a big kohlrabi fan too – and I was most surprised to see them here in Shanghai. Shame the roasted rhubarb didn’t taste as good as it looks – it’s a very pretty intense colour. You’ve got to be happy with a kitchen with beer and wine in it. Love this post Sandra. It seems nougat is loved in all places (I mean kitchen)! Sally is right: kohlrabi (alien though it appears) can be grand. I like it raw, too. But have you tried using it like potatoes in a gratin? That’s good, too. Have never been an ‘apple person’ but oh so love kohlrabi and cannot get it here in the country too oft. Learned to eat it and reach for it in Europe as a child: mmm, I kind’of love it steamed . . . that rather delicate taste really comes to the fore then . 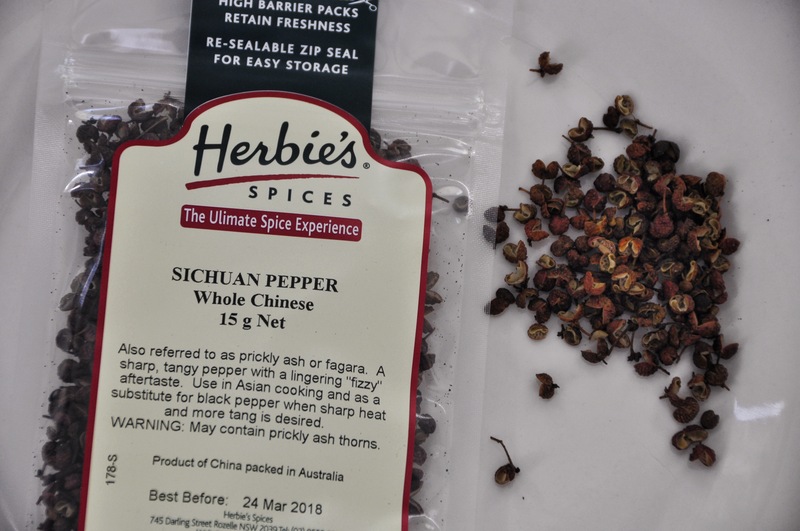 . . And thanks for reminding me a love letter to Herbies is due again: have found a few delightful Sydney firms for interesting mixes but for single spices I still wander over to Rozelle 🙂 ! Herbie never lets me down, next day delivery when ordered online, everything so so fresh! OK you’re the second person who has suggested I try cooking kohlrabi. I must! Thanks Margot, if the tasting works to plan I think there’ll be a post in it! I have enjoyed the apple testing posts! We are huge kohlrabi fans. We’ve been growing it in,our garden for several years now. I also prefer it raw in a thin julienne, usually in lettuce wraps. I’m a very late starter on the kohlrabi front, lots of catching up to so! Fun post! I love seeing your kitchen Sandra. Can you imagine the Coors Brewing Company put out a gluten free beer? They are testing out the market and it can only be found here in Seattle Washington and Portland Oregon. It’s pretty good. Well, I’d love to try NZ brews. 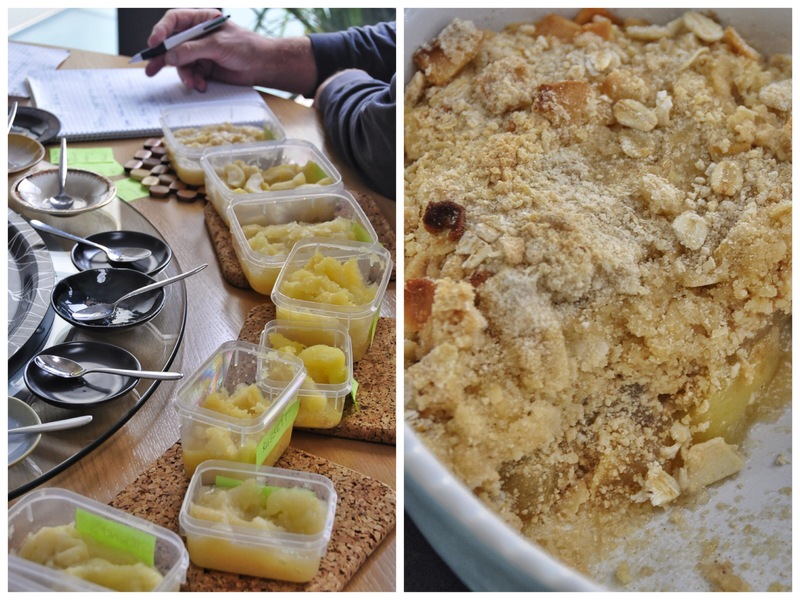 Love that you have been apple taste testing – it’s looking very methodical and organised. 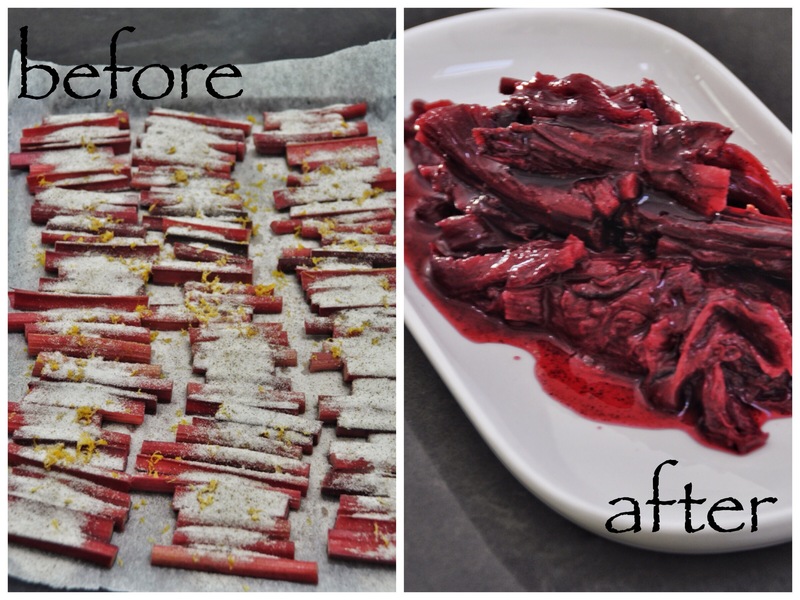 I often roast rhubarb with sugar, the zest of an orange and it’s juice squeezed over it. Served with homemade stem ginger ice cream – mmmm!. We used to eat a lot of raw kohlrabi in Canada when I was younger. It’s great as a crudite for dips and my mum loves it with a sprinkle of salt, chilli powder and a squeeze of lime juice. Those nougats sound so delicious! Thanks for the look in your kitchen! You’re always welcome in my kitchen Selma. I’ll try some powdered chilli on the kohlrabi dressing next time. Love your roasted Rhubarb Sandra and Herbie’s Spices are always great! I could go for a piece of the almond nougat now and thanks for this month’s IMK view too! You’re always welcome in my kitchen Joanne! It is wonderful to see your research on apples, and also on roasting rhunarb. I have tried Chateau Neuf du Pape but never 9 popes. it will be interesting to read about the result. Are they growing pepper berries in Tassie? Great news. Tasmania has native pepperberries, very firey! We’d be very happy to taste test your apples, we could swap a bottle of Nine Popes! Every NZ brew we tried was excellent! This entry was posted on May 5, 2015 by ladyredspecs in Food, In My Kitchen and tagged IMK, in my kitchen.